We just learned about the SM-65 Atlas. Another famous rocket was the Ariane. In Europe, a few countries worked together to make a rocket that would be used to launch things up into space, like satellites or even for space exploration. France, Germany and the UK came up with it and its first launch was in 1973. They were multi-stage rockets, using liquid rocket fuel. These rockets change a little every few year, but some are still mostly working today, launching satellites and exploration things into outer space. We just learned about the Flower Hat Jelly. Another type of jellyfish is the Moon Jellyfish. This type of small jellyfish only grows to be about 12 inches wide, and is mostly see through. It lives in cold or hot water in just about every part of the ocean in the world. They do not move very much, just mostly float around and try to eat up some plankton or fish eggs floating in the water. Other animals eat these jellyfish a lot, like fish or birds. Their sting is so little that most people can even pick up this jellyfish and hold it in their hand. We just learned about the Fungiform Papillae. Another part of the mouth is the Foliate Papillae. So we know the filiform papillae are just for touch, and the fungiform papillae have the taste buds. The foliate papillae are on the back and sides of the tongue, and almost look like they have folds on them. They are soft, and don't have any keratin, but they do have taste buds on them. We just learned about the Castillo de Colomares. Another famous castle is the Cairo Citadel, built in 1176 in Cairo, Egypt. It was built by Salah al-Din (Saladin) during the wars known as the Crusades. The wall and castle were built in the cities of Cairo and Fustat, and near the Nile so that they could try and control that part of the country from invaders. To get water to the Citadel, they built a 280 foot well in the castle, called the Well of Joseph, that is still there today. This well has a spiral staircase of 300 stairs going all the way down to the well. Later on they built a bunch of water wheels that helped bring the water up to the citadel and then the water would go on things called acqueduct which were like ramps that helped bring water from one place to another. We just learned about the Decian Persecution. Another part of early Christian history is the First Apology. The word apology used in this way comes from Greek, where it means a speech in defense. There was a man named Justin Martyr who was a Christian long ago, and when Christians were being treated badly by the Roman empire, he wrote a letter called the First Apology. It was a letter trying to explain that Christians were not bad people, and that the Roman empire should not treat them badly. People did not like Christians because they thought they did not want to be part of the Roman empire, and wanted to start their own kingdom. Justin wrote that they wanted to be in God's kingdom, but that was after they were in heaven. There were some people that said Christians were bad people and caused lots of crimes. He wrote that those people should be put in jail for their crimes, but not because they called themselves Christians, just because they did bad things. He also used the word Logos which means something like "Word" or "talking with reason" to talk about Jesus and tell people about the Word of God. People used the word Logos to say that someone was speaking with good reason. So if Jesus was with Logos then he had to be good. We just learned about the Elephanta Caves. Another famous Indian sculpture is the Rajagopuram Gopuram. A gopuram is a tower with a lot of sculptures all over it, that is at the entrance of a Hindu temple. The sculptures are usually telling Hindu stories, and have hundreds of sculptures all over them. There are many gopurams all over India at different temples, but the tallest one is at the Ranganathaswamy Temple, in Srirangam, Tamil Nadu, India. This temple area has 21 different gopurams around it that have been built over time for hundreds of years. The tallest one in the temple is the Rajagopuram, which is 240 feet high was built in 1987.
you are sad is Du er lei deg, and he is angry is Han er sint. Let's learn how to say they are excited. So all together De er begeistret sounds like day ah-r bay-gay-s-treh-t.
We just learned about the R-7 Rockets. Another famous rocket in history is the SM-65 Atlas. After the Russians had developed missiles that could go from one continent to another, the USA worked to try and do the same so they could have the same kinds of weapons. The SM-65 Atlas was the first rocket that the US made that was an ICBM, meaning it could fly all the way to another continent. It was made in 1959, was over 75 feet tall, and weighed over 260,000 pounds. The rocket fuel was liquid oxygen, held in thin stainless steel tanks that were held in place by the pressure of being full of fuel like a balloon. It used radio guidance to keep it's path, and vernier rockets to help make small steering changes. This rocket type was used for many years, and was the one used for the Mercury space program that launched American astronauts into orbit. We just learned about the Crystal Jelly. Another type of Jellyfish is the Flower Hat Jelly. These jellies live in the Pacific ocean near Japan and South Korea. The grownup jellies only live for a few months. They rest on the bottom of the ocean during the day, then at night they float up to catch their prey, like small fish. It's bell is mostly clear with a few darker stripes on it. Around the bell it has tentacles around the rim of their bell that it can use to sting prey. If a person gets stung by a flower hat jelly they will usually just get a painful rash. A full grown jelly can grow to be about 6 inches wide. When they are just starting to grow up, they are usually less than 1 inch wide. We just learned about the Filiform Papillae. Another type of lingual papillae is the Fungiform Papillae. Remember the lingual papillae are the bumps on the top of your tongue, and there are a few different types. The fungiform papillae are shaped like a club, and are usually red. They are mixed in along with all of the filiform papillae, but they are mostly found on the tip and sides of the tongue. These bumps have taste buds, and can sense the five different tastes: sweet, sour, bitter, salty, and umami. We just learned about the Chillon Castle. Another famous castle is Castillo de Colomares, in Benalmádena, Spain in 1987 by an American doctor named Dr Esteban Martín Martín. This is actually a monument, not really a castle. It was built to honor the discovery of the Americas by Christopher Columbus. At a size of 1,500 square meters it is the largest monument to Christopher Columbus, but it also has a tiny church inside that is only 1.96 square meters. It was made in a way to try and look like some of the different building and castle styles from when Columbus made his journey. There are also parts of the monument shaped like a boat, for the trip he made across the ocean. We just learned about the Antilegomena. Another part of early Christian history is the Decian Persecution. In the year 250 AD, there was a Roman emperor named Decius. Persecution means being treated badly, usually because of something you believe in. He did not believe in Jesus and did not want anyone to worship anyone else except for mythological Roman gods like Jupiter. So he made it a law that everyone in the country had to make a sacrifice to the Roman gods. If they would not do it, they would be killed. There were even some people that the emperor liked very much that were killed. Mercurius was a soldier in the Roman army who helped Decius win battles, but was a Christian and refused to make sacrifices to Roman idols. Even though Decius liked Mercurius, he still had him killed. Many Christians had to go into hiding during this time to survive, and many were killed because of this persecution. We just learned about the Ellora - Jain Caves. Another work of ancient Indian art is the Elephanta Caves. Just like the Ellora caves, these are caves with ancient carvings going back to before 200 AD. There are many caves with many different statues, and some statues that are over 20 feet tall. Most of the caves have Hindu sculptures, and the entrances to the caves all have columns with special carvings on them. There are more than a dozen sculpted walls in these caves, each telling a different Hindu story, and the whole cave area covers over 60,000 square feet. The caves get their name from a giant elephant sculpture that was found at the site. and you are sad is Du er lei deg. Now let's learn how to say He is angry. So all together Han er sint sounds like han eh-r sih-nt. We just learned about the PGM-11 Redstone. Another type of rocket from history is the R-7 Rocket. Sometimes it's called the R-7 Semyorka, because the Russian word for seven is "Семёрка" which sounds like Semyorka. After World War II when the Russians brought German scientists to work for their country making missiles, they learned a lot about making missiles, and made the R-1, R-2, and R-5 missiles. Then they sent the Germans home and started making their own missiles. The Russians made a missile called the R-7, and it was the first "ICBM" missile which stands for "Intercontinental Ballistic Missile". This means it could be launched from one continent like Europe or Asia, and fly all the way in the air to land on another continent like North America. For the first time in history, someone could launch a missile from over 5,000 miles away to bomb another city. Because this was such a scary thing, it pushed the scientists in the USA to try and make their own ICBMs to fight back if they were being bombed from across the Atlantic ocean. The R-7 rocket was not just used for war, it was used for space exploration. Sputnik was the first satellite to be launched into space to orbit the earth. In 1957 the Russians used a type of R-7 rocket to launch it up into space. This also pushed the other countries of the world like the USA to make rockets for space exploration. We just learned about the Upside Down Jellyfish. Another type of jellyfish is the Crystal Jelly. This type of jelly is mostly clear, with lines called radial lines in the bell part of its body called the bell that help it swim. Around the outside of the bell are small tentacles that it uses to sting its prey, but the sting does not hurt humans. It's mouth is hanging down in the middle, and this jelly eats very tiny things like plankton or barnacles. They live mostly in the Pacific Ocean, off the coast of California. We just learned about the Taste Buds. Another part of the tongue is the Filiform Papillae. The lingual papillae that we learned about come in a few different shapes and sizes. One of those is the filiform papillae, which are small and cone shaped, with small threads at the top. These papillae do not have any taste buds, they are only used by the tongue for feeling, and to give the tongue a rough feeling. The tongue has more filiform papillae than any other type of papillae. We just learned about the Kilkenny Castle. Another famous castle is the Chillon Castle, built in Veytaux Switzerland in 1005 AD. It is built on a small island, right on the edge of Lake Geneva. When it was first made, it was built to defend some of the valleys and roads in the area, but later on was used as a prison for some famous people. The prince's castle in the Disney movie The Little Mermaid was made to look like this castle. We just learned about the Muratorian Fragment. Another part of the early Christians working on the Bible is called Antilegomena. When people were trying to collect all of the writings about Jesus and what happened to him and after him, some people disagreed on which were real letters and which ones were fake. There was a lot of disagreement because long ago it was very hard to figure out which letters were real, so if people disagreed on a writing it was called Antilegomena. It is a Greek word ἀντιλεγόμενα that means "spoken against". Remember we learned about people deciding which books were "canon" meaning measured or accepted. 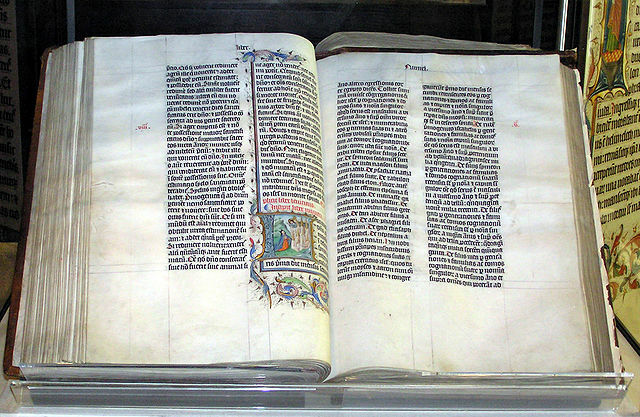 If a book or letter was Antilegomena, then it was usually not accepted as "canon" and would not be put into a Bible. We just learned about the Ellora - Hindu Caves. Another part of the Ellora area is the Ellora - Jain Caves. The people who made the Jain believed in different things than the people who made the Hindu or Buddhist caves, but they were built right along side the Hindu caves at about the same time. Just like the other two sets of caves, these areas have special sculptures of gods and goddesses that people worshipped, and also temples and special worship areas.